This post will be a bit of a surprise to those of you that know me in real life, as it’s about gardening! I am not a natural gardener but I am trying to learn. I’m going to show you how to make an indoor salad garden from an old cot side. It’s super easy and doesn’t need any tools. 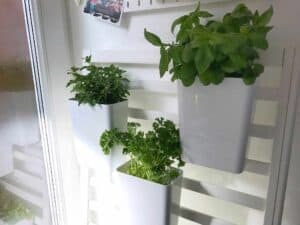 We chose to put ours in our kitchen, but you could also lean this vertical salad garden against a fence outside. I think it looks so nice beneath my organisation station, what do you think? Hopefully I’ll be able to keep it lush and green like this… wish me luck. What You’ll Need to Make an Indoor Salad Garden from an Old Cot Side This was such a quick and easy DIY project, with no tools needed, yay! I have been hoarding the sides of the girls’ old cot bed for years, knowing they would come in handy. After we turned the cot bed into a toddler bed for for Thea, it broke a bit so couldn’t go back to being a cot bed again. I was so happy to have hit on this idea to give the sides a new lease of life (and justify my years of hoarding). What you’ll need to make an indoor salad garden from an old cot side: An old cot side. Ours is a cot bed, but a cot would be just fine but a little smaller Containers with a hanger, ours are the VARIERA containers from IKEA, which were £4 each for the smaller ones and £6 each for the larger ones Broken crockery Compost Herbs and salad – we got ours ready-grown from our local garden centre but you could try seeds if you prefer How to Make an Indoor Salad Garden from an Old Cot Side Find a sunny spot in your house and lean the cot side up against it. You could fix your cot side to the wall but we may move ours so we have leaned it up like a ladder. It’s pretty heavy now it has all that compost in it, so isn’t likely to fall over. Carefully break up some old pots or cups and scatter them on the bottoms of your containers. This will help with drainage, to make sure your plants don’t get waterlogged. If you wanted to have your salad garden outside, you would need to drill holes in the bottom of each container for drainage. Add compost on top, to around a third of the capacity – you don’t want them to get too heavy by over filling. Gently remove your herbs and salads from the pots they came in, and add to the containers, adding more compost around them until they are roughly level. Clean the compost from the sides and base of the containers and take them inside. Slot the containers over the bars of the cot side. Water the plants and admire your indoor herb garden. The evening sun streams into this area of our kitchen/diner, so we think this will be a good location for our indoor salad garden. Which Herbs to Plant in Your Indoor Salad Garden There are loads of things you could plant in your indoor salad garden. I chose mint, basil, parsley, thyme and a couple of varieties of lettuce. We have a huge rosemary bush in our garden so didn’t need to grow more of that. We’re trying our hand at trailing strawberries on the bottom layer – finger’s crossed they work. Other plants that would work well for an indoor edible garden are trailing cherry tomatoes and spinach. We have got some spinach seeds to plant up as we couldn’t find any ready-grown at the garden centre. So now we have our indoor salad garden, I can’t wait to use the salad and herbs in my cooking. Fresh herbs are so much nicer than dried ones, don’t you think? If you like my ideas for how to make an indoor salad garden, why not Pin this for later?